For cats that live in apartment buildings or in areas where there are many dangers such as cars or wild animals, leash training can offer the opportunity to get outside while remaining safe. The ideal age to start leash training is around 6 months old (though many people have successfully trained adult cats to walk on leashes). The likelihood of success is higher with cats that have been spayed or neutered. Rather than using a collar with a leash, cats should be walked using a proper harness or walking jacket designed specifically for felines. Walking jackets are recommended because they are more secure and comfortable. Cats are escape artists, so you should choose a harness that is not easy to squirm out of. Harnesses should be H-shaped, fastening at the stomach and neck. The leash should pull from between the shoulder blades rather than the neck. For successful harness training, the harness must fit comfortably. It should be snug but not tight. There should be two finger widths of space at the stomach and neck. Attach an ID tag attached to the harness in case the cat is startled by a loud noise or another animal and makes a run for it. Before beginning harness training, leave the harness out where the cat can sniff it and play with it. After a few days, put the harness on the cat for 5 minutes, but don’t attempt to walk the cat. Offer him his favourite food or treat, along with praise, right after putting on the harness so that he associates the harness with positive experiences. Once he has eaten, let the cat wander around for awhile in the harness so that he gets used to it. Do this several times each day for 7-14 days. Once the cat is accustomed to the harness, you can attach the leash and pull gently, asking the cat to come while offering food or a special treat. When the cat is comfortable with the harness, you can carry him outdoors, speaking calmly and reassuringly, and perhaps providing some food outside. If leash training an outdoor cat that is used to coming and going as he pleases, keep him indoors for an increasing length of time each day before beginning the training. This will help him to associate the harness with the positive experience of going outside. When taking your cat for a walk, choose a quiet area at a time of day when there are fewer people, animals, and vehicles around. Parks and other green spaces are ideal, as long as there aren’t a lot of large, exuberant dogs in the area. Don’t expect your cat to walk on a leash obediently the way a dog does. Walking a cat is a compromise of interests. Sometimes you get to lead; sometimes the cat leads. Cats need to vary their pace and stop to explore from time to time. However, it’s important to let the cat know that he will not get to lead all the time. Once your cat begins to enjoy his adventures, he may become overly enthusiastic, pulling at the harness and practically ricocheting off the walls or various objects outside. In this case, stand still, hold the leash, and wait until he calms down, praising him for being good when he stops pulling. This stage of training requires great patience. Once you have begun walking your cat outside, there are a number of dos and don’ts that, if followed, will ensure that leash walking is a safe and positive experience. Work on harness training every day—cats are creatures of habit, so making a habit of harness walking will help the cat grow accustomed to it. Offer lots of reassurance, as cats are inclined to be skittish when hearing loud noises or encountering other people and animals. Provide praise, affection, and rewards when the cat lets you lead with the leash and follows without digging in his heels. Use punishment or harsh words when the cat refuses to walk or tries to go off in another direction—this will cause him to associate the harness with negative experiences. Drag the cat along with the leash if he’s trying to wander off. Stop and wait, give a light tug and release, but don’t pull continuously. Leave a harnessed cat unsupervised, as he’s defenceless and may become prey to roaming animals or entangled in his leash. Harness training provides a compromise between depriving a cat of outdoor experiences and exposing him to the dangers that claim the lives of many outdoor cats. Handled properly, such training enables cats and owners to spend quality time together outdoors without compromising the cat’s safety. HDW Enterprises & Foothill Felines Bengals. (n.d.). “How to Leash Train Your Feline.” HDW-Inc.com. Krieger, M. (27 June 2008). “Walking Cats.” CatChannel.com. Ottawa Human Society. (n.d.). “Harness Training for Cats.” OttawaHumane.ca. Regina Humane Society. (n.d.). “Harness Training Your Cat.” ReginaHumaneSociety.ca. Syufy, F. (n.d.). 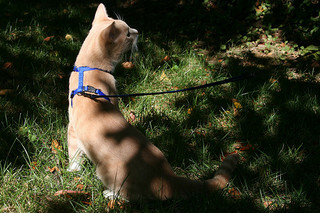 “How to Train Your Cat to Walk with a Leash.” About.com.